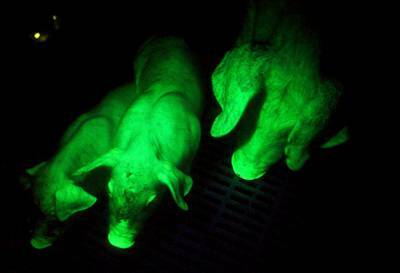 Clever researchers at Northeast Agricultural University in Harbin in China announced that they had successfully managed to breed three transgenic pigs by injecting fluorescent green protein into embryonic pigs. The intent was to give a boost to stem cell research; Genetic material from jellyfish was injected into the womb of a sow which gave birth to the three pigs 114 days later. Professor Liu Zhonghua stated that "the mouth, trotters and tongue of the pigs are green under ultraviolet light." Eerie green glowing SPAM cannot be far away. Probably not coincidentally, China celebrates the Year of the Pig starting in February. The goal of the pigoon project was to grow an assortment of foolproof human tissue organs in a transgenic knockout pig host - organs that would transplant smoothly and avoid rejection, but would also be able to fend off attacks by opportunistic microbes and viruses, of which there were more strains every year. Jokes about fluorescent green SPAM are probably apropos; in her novel, Atwood's biotech workers need to eat something, and there are a surprisingly large number of "pork-based" dishes in the company cafeteria. Waste not, want not. Thanks to Adi for writing in with this story and Atwood tip; see China heralds year of fluorescent green pig for the scanty details.